A long-running tradition in Jewish lore claims that a Roman soldier named Pantera (or Panthera, or Pandera) was the true father of Jesus. This claim first appears in the work of the pagan philosopher Celsus, who wrote a polemic against the Christians and likely learned the story from second century CE Jewish informants. It was perhaps most notorious for its appearance in the anti-Christian satirical Gospel, the Toledot Yeshu of the Middle Ages. The story is today taken seriously by scholars like James Tabor, who assert that the story could be proof of the true origins of Christianity. 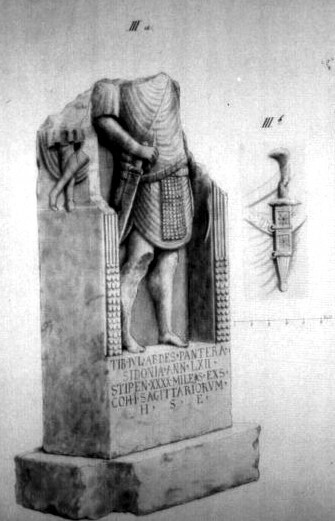 Tabor further argues that the Pantera of legend can be identified with a Roman soldier who died in Germany and whose tombstone was discovered in 1859. “I became convinced that the possible connection of this Roman soldier with the traditions related to Jesus’ father should not be dismissed out of hand just because it sounds offensive to piety and faith,” he wrote in The Jesus Dynasty ​in 2006. But let us now return to where the Jew is introduced, speaking of the mother of Jesus, and saying that “when she was pregnant she was turned out of doors by the carpenter to whom she had been betrothed, as having been guilty of adultery, and that she bore a child to a certain soldier named Panthera;” and let us see whether those who have blindly concocted these fables about the adultery of the Virgin with Panthera, and her rejection by the carpenter, did not invent these stories to overturn His miraculous conception by the Holy Ghost: for they could have falsified the history in a different manner, on account of its extremely miraculous character, and not have admitted, as it were against their will, that Jesus was born of no ordinary human marriage. It was to be expected, indeed, that those who would not believe the miraculous birth of Jesus would invent some falsehood. And their not doing this in a credible manner, but (their) preserving the fact that it was not by Joseph that the Virgin conceived Jesus, rendered the falsehood very palpable to those who can understand and detect such inventions. Is it at all agreeable to reason, that he who dared to do so much for the human race, in order that, as far as in him lay, all the Greeks and Barbarians, who were looking for divine condemnation, might depart from evil, and regulate their entire conduct in a manner pleasing to the Creator of the world, should not have had a miraculous birth, but one the vilest and most disgraceful of all? And I will ask of them as Greeks, and particularly of Celsus, who either holds or not the sentiments of Plato, and at any rate quotes them, whether He who sends souls down into the bodies of men, degraded Him who was to dare such mighty acts, and to teach so many men, and to reform so many from the mass of wickedness in the world, to a birth more disgraceful than any other, and did not rather introduce Him into the world through a lawful marriage? Or is it not more in conformity with reason, that every soul, for certain mysterious reasons (I speak now according to the opinion of Pythagoras, and Plato, and Empedocles, whom Celsus frequently names), is introduced into a body, and introduced according to its deserts and former actions? It is probable, therefore, that this soul also, which conferred more benefit by its residence in the flesh than that of many men (to avoid prejudice, I do not say “all”), stood in need of a body not only superior to others, but invested with all excellent qualities. (Rabbi Eliezer said:) Once I was walking in the main street of Sepphoris, and met [one of the disciples of Jesus the Nazarene] Jacob of Kefar Siknin, who repeated to me a heretical saying in the name of Jesus ben Pantera which pleased me well. Bracketed words are only in the Avoda. Translated by George F. Moore. Translated by ​Robert Van Voorst (2000). In the year 3671 in the days of King Jannaeus, a great misfortune befell Israel, when there arose a certain disreputable man of the tribe of Judah, whose name was Joseph Pandera. He lived at Bethlehem, in Judah. Near his house dwelt a widow and her lovely and chaste daughter named Miriam. Miriam was betrothed to Yohanan, of the royal house of David, a man learned in the Torah and God-fearing. Translated by Morris Goldstein (1950).